Other Subjects SNV PUM. 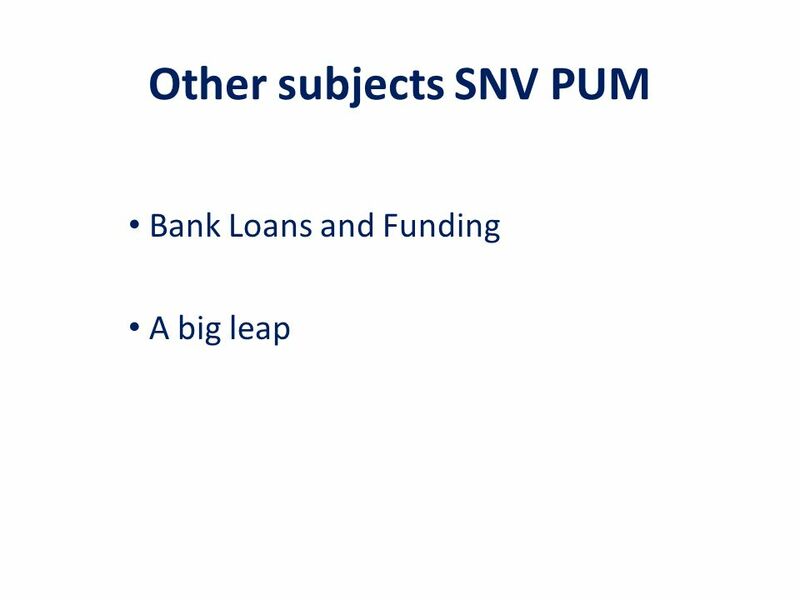 Other subjects SNV PUM Bank Loans and Funding A big leap. 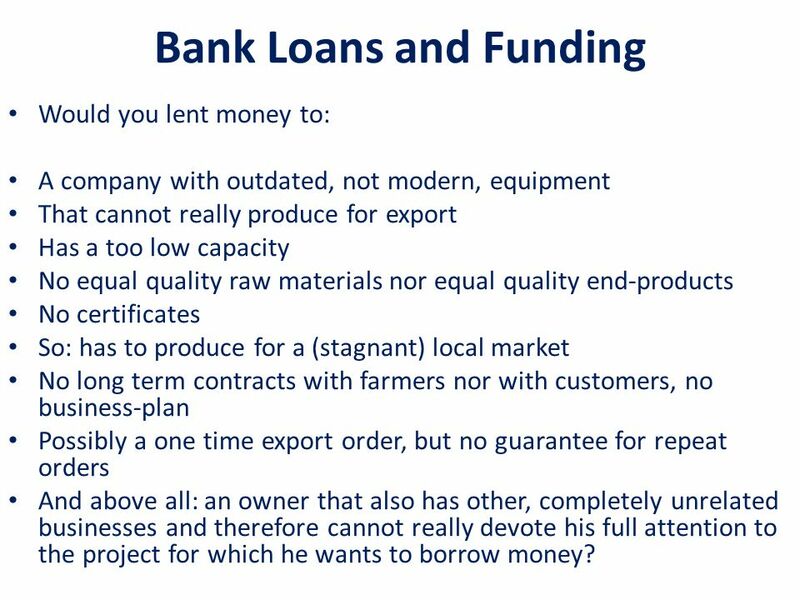 4 Bank Loans and Funding Would you lent money to: A company with outdated, not modern, equipment That cannot really produce for export Has a too low capacity No equal quality raw materials nor equal quality end-products No certificates So: has to produce for a (stagnant) local market No long term contracts with farmers nor with customers, no business-plan Possibly a one time export order, but no guarantee for repeat orders And above all: an owner that also has other, completely unrelated businesses and therefore cannot really devote his full attention to the project for which he wants to borrow money? 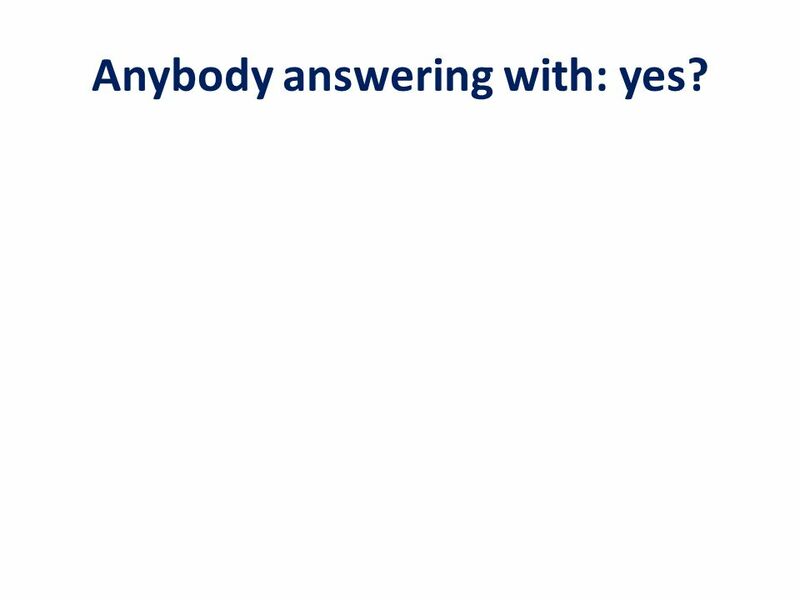 5 Anybody answering with: yes? 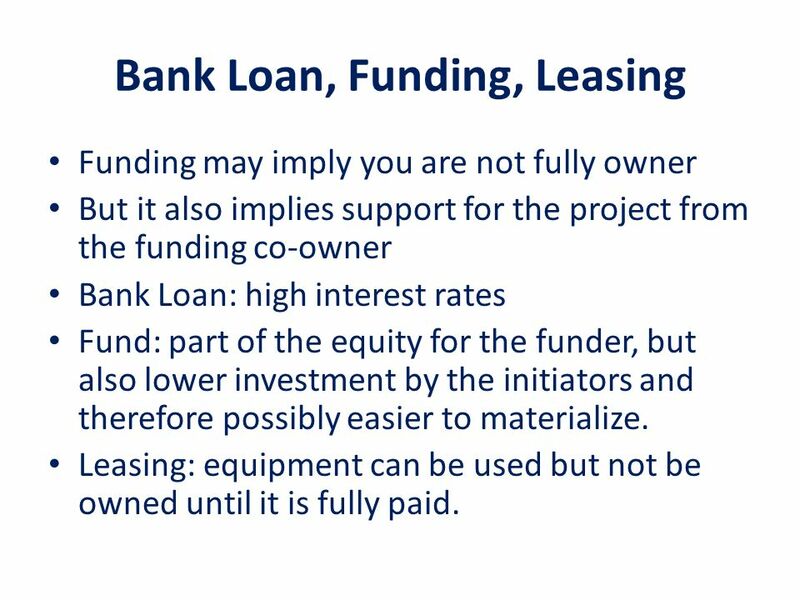 6 Bank Loan, Funding, Leasing Funding may imply you are not fully owner But it also implies support for the project from the funding co-owner Bank Loan: high interest rates Fund: part of the equity for the funder, but also lower investment by the initiators and therefore possibly easier to materialize. Leasing: equipment can be used but not be owned until it is fully paid. 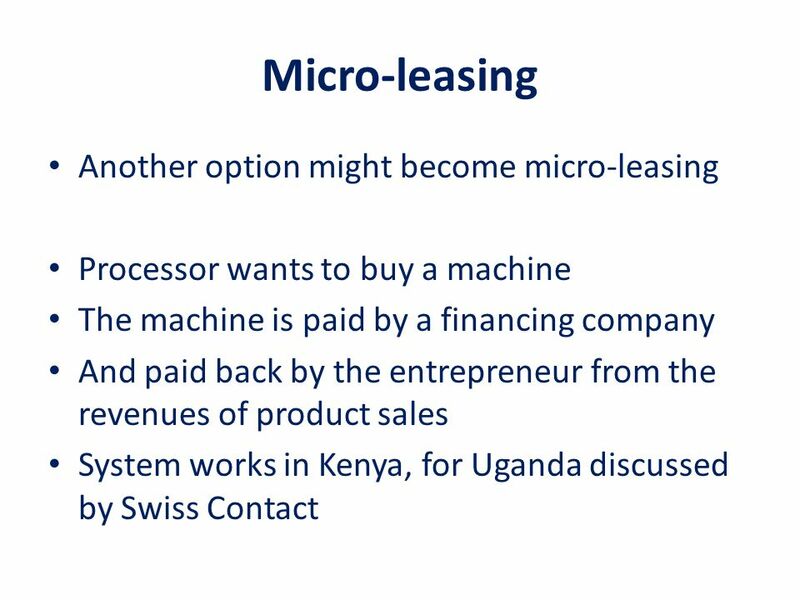 9 The big leap forward If small companies cannot get funds or loans, then what is a solution? Join forces Dont build many drying plants in one area Combine resources Build one together Make a good business-plan Hire a professional manager or: Let one of the owners pay full attention to the project Find the proper support, financially, managerial and organizational, re. plant lay-out and routing, equipment, quality aspects etc. On any aspect required. Download ppt "Other Subjects SNV PUM. Other subjects SNV PUM Bank Loans and Funding A big leap." WHO ARE YOUR CUSTOMERS? -Who are you marketing to? -How many potential customers are there? -Does your organization have a lot of people coming through. Tax Lien Investments, LLC ‘Our Expertise Makes Us #1’ WelcomeHow Tax Liens WorkAdvantage TLILet’s ConnectWelcomeHow Tax Liens WorkLet’s Connect Welcome. USAID – Workshop on agricultural sector financing THE5Cs OF A GOOD LOAN Workshop on July 22 and 23, 2011. Starting a Business tutor2u ™ GCSE Business Studies Revision Presentations 2004. 6-1 Becoming an Entrepreneur 6-2 Small Business Basics 6-3 Starting a Small Business. 1. Introductions Bob is responsible for the management and oversight of all aspects of NextGear Capital’s business in the South Atlantic Region, including. 1 Sources of Finance Special thanks to Geoff Leese. 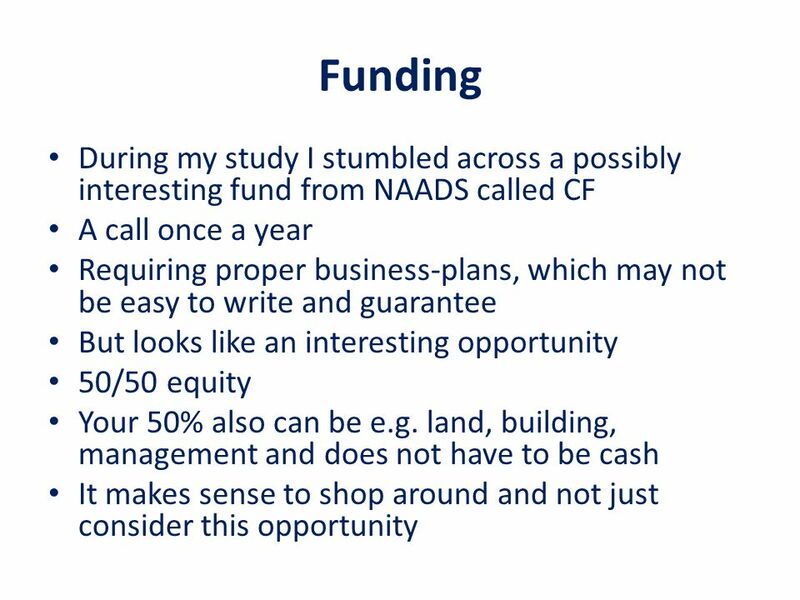 Lcameron1 METHODS OF OBTAINING F I N A N C E. lcameron2 WHY DO FIRMS NEED MONEY?  To survive and pay bills  To grow in size WHERE CAN THE MONEY COME. An Introduction To The Financial Markets T H O M S O N F I N A N C I A L.
Lim Sei cK.  Often the hardest part of starting a business is raising the money to get going.  The entrepreneur might have a great idea and clear. NextEnd. Preparation of Business Plan for Setting up Enterprise Business Plan.. The business plan is a written document prepared by the entrepreneur that. 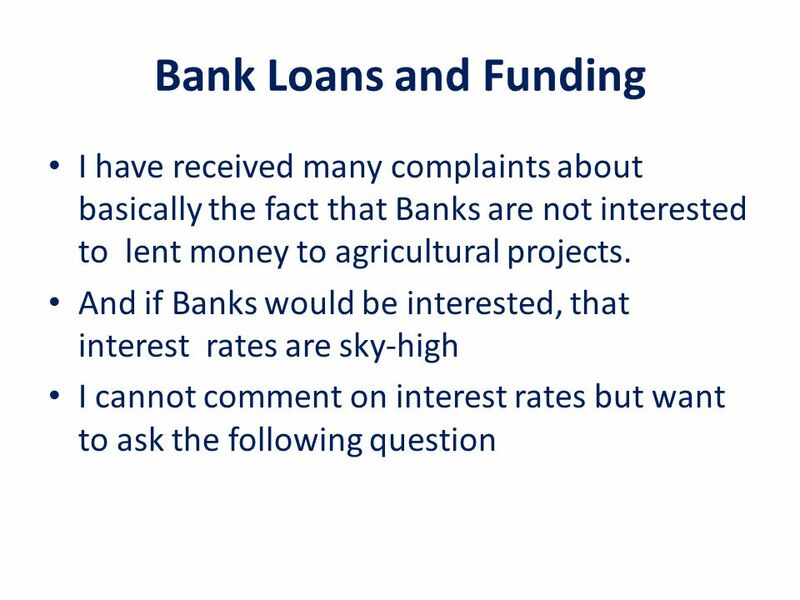 Understanding the cost of capital Agricultural businesses rely on borrowed capital for inputs, machinery, equipment, and land Managing debt capital requires. MONEY MANAGEMENT BY: ERIC WALKER REVIEW UNITS 1-4.